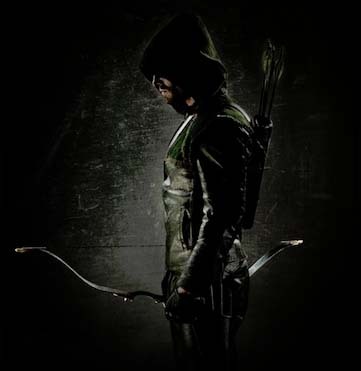 Here’s the first photo from the Arrow TV series (that’s as in ‘Green’, as in ‘DC Comics’). We are promised dark things for this, as opposed to Smallville Continued, by Arrow executive producer David Nutter. “When I directed the pilot for Smallville, I knew that making Clark Kent relatable would be the key to audiences believing in him as a hero. Arrow is a different show — darker and harder-edged — but it’s the same core idea. We’re creating a real, believable world in which Oliver Queen can do incredible things,’ muses our David. Now, Hawkeye vs Green Arrow… who wins, who loses? … so much as I used to be a Marvel guy, I’ve got to go with Green Arrow on this one. I think I might have to agree with you there, Eric!